How does one bridge generations that grew up oceans apart? Bringing up children is never easy; but even harder is bringing up parents! For Indian immigrants and their American-born children, life sometimes seems to be running on two parallel rail tracks with a lot of shouting, arguing and explaining and no connecting. After all, the worlds the two generations grew up in are oceans apart. The parents’ world was a sepia toned universe of deference to elders, living by the rules, letting the extended family and society decide when you married, had children, worked, or lived. The children of these immigrants have been flung into neon lit, fast-paced America where rules exist only to be challenged and where the individual is king and master of his own destiny. For Indian parents, brought up with a certain worldview and expectations, it has been disconcerting to bring up American children. Many a soap opera has played out in desi homes across the United States as parents have encountered in their children the American traits of questioning authority, speaking up and doing your own thing. And then there are the thoroughly American rituals of dating and mating, of moving out to your own apartment or even moving in with a “significant other.” Enough to give desi parents many a sleepless night! Yet a sizable number of Indian immigrant parents have been in the United States for 20 or 30 or 40 years, surely enough time to readjust and realign – and Indians are nothing if not adaptable. So in all the ensuing years have parents and children made their peace and found themselves on a common track? Then of course there are the children of the new immigrants in the past decade. How do these children, some of whom do not even speak English, fit into America and how do they interpret this bewildering country for their parents? Some families are able to pass on their cultural and social traditions to their children even as they assimilate into the mainstream, while others hold back on their Indian-ness so that their children may find a peace in their the new world. Each family tries to find its own way through the maze of America so each story is different, albiet with some common threads. Satya Chheda has been on both sides of the fence, as child and future parent. She was born in America to parents who journeyed here from Kutch, Gujarat, in the 70’s, and now that she is married, hopes to start her own family here. Her father came to the United States for his MBA and stayed on in Springfield, Ohio, to teach at a community college. Satya Cheddy, seen here at wedding, has straddled both fences. Satya knew she was Indian because there was Indian food on the table, and her family talked about India often. The only Indian grocery store was 50 miles and the only Hindu temple an hour and a half away. There was a void in the space of religion and community. She went back to India only twice during her childhood and she just didn’t feel connected. 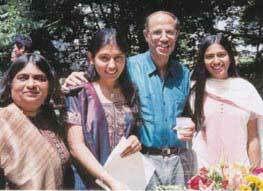 When Satya met a young Indian American in college and he moved in with her after a month, it was a shock for everyone, and though it was an issue with her parents for a while, her mother was much more open-minded. The couple later got engaged and married three years later. Ask Pushpa about the empathy she feels towards her daughter’s experiences and she says, “When I was growing up in India, I saw how difficult it was to date. There was so much family pressure and you always had to consider others in the extended family. Here you want your children to make their own life and you don’t have to worry about what people will say. Meenal Pandya, who writes books on Indian culture for her Massachusetts-based publishing company Meera Publications, agrees. For women the freedom to be themselves without having to think about societal disapproval all the time is liberating. When it is 95 degrees in Ohio, Pushpa Chedda dons shorts for her morning walk, something she would not dare do in India for fear of raising eyebrows. The shorts, for her, are a symbol of a lifestyle change, freeing women to be more outspoken, take risks and try new things. And this certainly filters down to the daughters too. Pandya raised her two girls, Shirali and Amoli, in Wellesley, Mass., which has a very small Indian community, but was careful to keep the lines of communication open. The children haven’t been force-fed their Indian roots but were taken every few years to meet their grandparents in India, and introduced to Indian culture in many different ways. Last year Shirali, who is a junior at MIT, volunteered at SEWA in Ahmedabad. As the years have gone by, Indian parents seem to have mellowed. Yes, they are still pushy parents, driving their children to Spelling Bee success and Ivy League colleges, but they seem to be willing to look at their children’s dreams too, now. This also finds hreflection in the number of young Indian Americans entering non-traditional careers, like acting, singing, deejaying and journalism. But delve a little deeper, and you find many of these young people have MBA’s or law degrees under their belt. Indian parents’ insurance! However, while parents might have tolerated their children’s sleep-overs, heavy metal concerts, late nights and even given in to their impractical career choices, matrimony still remains a major tension point. By a miracle, the girl actually did find a Brahmin boy on campus and made her mother very happy. Neverthless, parents are changing and sometimes it’s because the change has been thrust upon them. Intercultural marriages are growing within the Indian community and faced with the question of their children’s happiness many parents first resist, agonize but finally give in. And many of them are pleasantly surprised when they get to know the non Indian families and find their new son or daughter-in-law adapting to their culture. Indeed, Indians bring so much baggage to the wedding scene, that it’s almost a relief for them to find that there are no in-law hassles to face, no complicated giving and taking and of course, American boys have no maharaja airs. When a family took their newly married daughter to India, her American bridegroom won everyone’s hearts by doing ‘pranam’ to the elders and acting more dutiful than most Indian grooms! Yet another young Caucasian who accompanied his fiancée’s family to India for their wedding awed the entire extended family by insisting on sweeping the floor that was to be decorated with rungoli. He had no princely ‘damad’ attitude and endeared himself to everyone with his hands-on informality. While matrimonial ads and wedding fairs still hope to find the ideal spouse from the same region and community, many Indian parents have also seen weddings within the community that have not turned out happily. They are more willing to be more open-minded about their children’s choices, be it from a different region of India or a different race altogether. The story of Ajit and Lata Mody of New York illustrates how immigrants negotiate their way through two cultures and pick the best of both. Mody came to study mechanical engineering at Pratt in 1968, and went on to become an engineer with the city of New York. In 1990, aware of the burgeoning South Asian population, the couple turned entrepreneurs and opened Rajbhog Sweets. 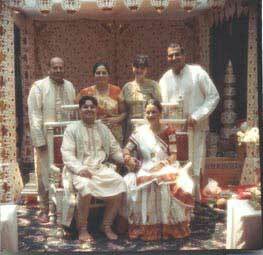 The Modys raised their two sons Sanjiv and Sachin here: the boys went on American colleges and non-Indian wives while still retaining their Indian culture and connections. The closeness between parents and children remains, with not even a day passing by without frequent phone calls. Mody says, “Initially it was not easy, but we decided why not see to the happiness of our children rather than enforcing our ideas on them? Once the children are grown, it’s their lives.” Both daughters-in-laws, Suzanne and Suzy, have picked up some Gujarati, participate in cultural events and have adapted to the Indian culture. In a way, Sanjiv and Sachin, with degrees in accounting and electrical engineering from prestigious universities, have paid the supreme compliment to their parents by giving up their jobs in Corporate America to tend to the traditional business that started out as a mom and pop venture. They’ve taken the all-Indian mithai shop and turned it into a corporate semi-mechanized business. Says Sachin, “Our parents put a lot of hard work into creating it and as we were growing up we often spent the summers helping them out in the business. Basically it became a part of our blood.” They’ve used their American education and know how to mechanize the sweets business and take it national, distributing in 40 states. He believes the young student who came here 30 years ago is very different from the man he is today. Previously, he says, it was a diehard attitude of “I’m perfectly right and you’re perfectly wrong,” but age and experience have taught him to see both sides of the picture. This nuanced thinking of allowing space and respecting opinions has resulted in a happy family life. While the early Indian immigrants from the 1960’s and 1970’s may have clashed with their children on career choices and marriage plans – or lack of them – or falling in love with non-Indians, the children of the new immigrants wrestle with some new issues. Satya Chheda, who grew up in Springfield, Ohio, teaches social studies at the 9th grade level in New York, about five classes a day totaling 170 students. Since two of the classes she teaches are ESL classes, the majority of her students are South Asian, newer immigrants from Punjab region in India and Pakistan and Bangladesh. She points out that the parents who have lived here longer are more in touch with the education system, have better English language skills and so are able to be involved with the school. The new immigrants generally don’t speak English and mostly don’t attend parent teacher conferences. New immigrants, caught in the vortex of making a living, often have financial pressures, language barriers and immigration woes. All these spill into the lives of the children who have been flung into an American world, but expected to be Indian by their traditional parents who have so freshly left their homeland. Many are from the lower socio-economic strata, the children of cab drivers, restaurant workers, domestic workers and newsstand owners. Annetta Seecharran, executive director of SAYA!, South Asian Youth Action, based in Elmhurst, Queens, works with the children of new immigrants in career preparation, leadership development and counseling. Most inner-city immigrant families live in under-resourced neighborhoods with overcrowded schools which are not always culturally sensitive to the needs of South Asian youth.For these children, life is very different from that of immigrant children living in suburban palaces, where the anonymity of the suburbs facilitates assimilation. While children of earlier immigrants had no choice but to immerse with the mainstream, because they were so few in numbers, the burgeoning South Asian population means there is critical mass: “In urban settings the larger numbers translate to more support for maintaining the culture and so a greater expectation on the part of parents that the children will maintain the culture,” says Seecharran. “There’s not so much pressure for young people to assimilate, there’s support for their Indianness, if you will.” Having a large community can be both a blessing and a hindrance to assimilation. Immigrant parents, on the other hand, have straightforward goals of economic well-being and expect their children to do well in school and get a well-paying career and there’s friction when they feel they are getting side-tracked. Deepa Patel is one young woman who grew up as the child of new immigrants and has seen the ups and downs of the immigrant life. Her mother first came here as a nurse and then called the rest of the family. But making a living was hard and her father could not find a job so the children were sent to India to relatives. The dynamics between Indian parents and their American children continue to change and evolve as each finds their own comfort level in America. Satya Chheda, for one, has long since reconciled with her roots and in fact is keen to put her children in closer touch with the Indian culture than her parents had. “Being raised in America, they will already be exposed to the influences in school,” she says. ” I want them to learn a language, Hindi or Gujarati, because I don’t speak my own language and I can’t communicate with my grandparents and my relatives in India and that’s really frustrating.” She also plans to take them to India more often and get them involved in community events so that they have a full identity and an appreciation of their Indian culture too. Loss and gain. That’s what the immigrant experience is all about. The first generation was enmeshed in the struggle of making it in America, often changing their names and beliefs to fit in. Now their children have the luxury of choices, of creating their own template for what it means to be Indian American.